Quality Vilene iron-on interfacing. 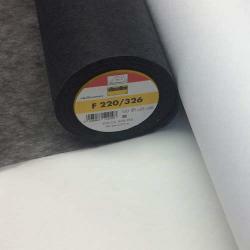 Adds stiffness to other fabrics in for instance brims, cuffs, waistbands, zipper holes, etc. Useful in many gear projects. Apply to reverse side of fabric with the dotted (glue) side down using a steam iron at about 130 degrees Celsius. Apply pressure for 12-14 seconds. Only 18.68 m left in stock, after the stock is empty this product is not available. Only 20.71 m left in stock, after the stock is empty this product is not available.